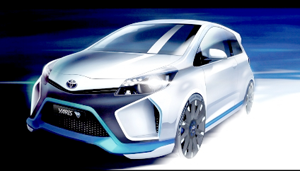 In addition to the world reveal of the Yaris Hybrid-R concept, Toyota said it’s presence at the 2013 Frankfurt Motor Show will be devoted entirely to hybrids. Toyota’s hybrid portfolio consists of 23 models sold in 80 countries around the world. As of the end of July 2013, Toyota had sold over 5.5 million hybrid products. Now the automaker said the Frankfurt show will showcase further potential technology directions in the future of low-emission and zero-emission vehicles, namely the Yaris Hybrid-R concept. 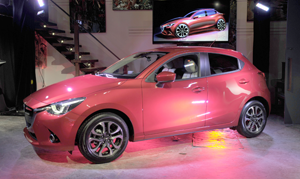 The new vehicle is based on the Yaris three-door. The powertrain combines the powerful 1.6 L Global Race Engine (GRE) developed by Toyota Motorsport GmbH (TMG) with two powerful electric motors to provide an ‘intelligent’ electric four-wheel drive capability. Just like in the TS030 HYBRID, the energy recovered during the braking phase is stored in a super capacitor, particularly suitable for a sports car because of its high power density and quick charge and discharge speeds. The result is a highly focused concept car dedicated to maximizing driving pleasure on road and on track. 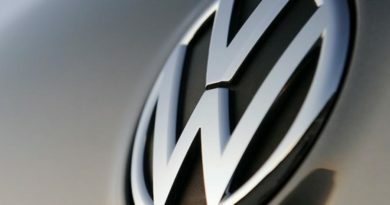 The automaker also confirmed its intentions in fuel cell technology calling it the nex step towards the ultimate zero-emission car.